Please feel free to contact Scott with any questions you have. I'd be happy to help you get the information you need and/or provide any additional information that will help a prospective buyer make the right decision. The goal here is to create the environment for a smooth transaction at a price that works for both buyer and seller. 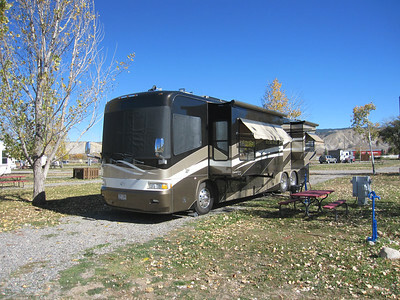 Coach is located in Montrose, CO. If you'd like to represent me as a seller, I'd be happy to pay a fair commission for that service. Please contact me to discuss those arrangements. I'd appreciate any help and advice you can provide. 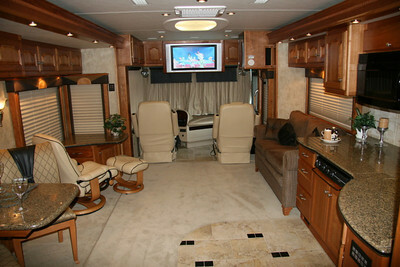 We purchased this coach used in Florida for $268K with 16K miles on it back in August 2007. I can make available the original CC build sheet as well as our purchase paperwork. The previous new owners were upgrading to a 45 foot coach and this coach became available. It satisfied all of our requirements for a coach to be used for full time travel. So we became the second owners and began our traveling in September of 2008. I did a lot of work on it between August 2007 and September of 2008 when we left New Jersey to begin our traveling adventures. Most of the traveling we did was in Washington, Oregon, Idaho, Arizona, Utah and Colorado. The coach has never been driven to Alaska or in winter salt conditions. Most of our stays ranged from 3-6 months where we used our van to satellite out to explore the region. About 24K miles have been put on this coach since we began traveling in it. An average of about 4K miles per year. Our lifestyle has changed since we began traveling 6 years ago and we'd like to scale the full time traveling back to shorter road trips. Presently we are looking to purchase a house in the Montrose, CO area which is a place we feel good about digging in some roots. This area is close to all the outdoor spaces we enjoy. It isn't practical for us to have a house and keep this coach. For this reason we've decided to put it up for sale to get it in the hands of someone else that will enjoy traveling in it. These coaches are made to be driven, used on a regular basis and lived in. 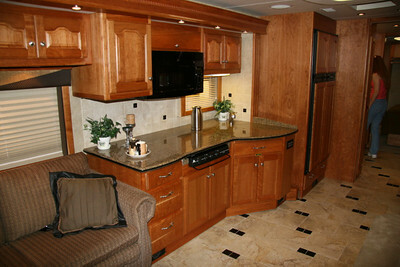 This coach will provide its next owner with reliable transportation and exceptional comfort. For those experienced with Class A motor coaches, repairs and problems go along with owning these vehicles. No makes/models regardless of price are exempt from problems. I have chronicled our travels and all the work that's been done on this vehicle over the years we've traveled in it. All the major outstanding issues have been dealt with at this point. There remain some cosmetic items to address which can be negotiated in the price. It's perhaps one of the best documented vehicle stories you'll find out there. An entire website has been devoted to our travel experiences, upgrades, projects and repairs. Link is HERE. I've also been very active on Yahoo's Country Coach news group. This has been a valuable source of support information for all Country Coach owners. Information coming back from other owners via this news group has allowed me to proactively repair problems before they became serious and/or led to breakdowns. For example, I was able to replace the coolant return hoses with silicone hoses before they failed. I would strongly suggest participating in this group if you plan on purchasing our coach. I'm comfortable that the major issues have been worked out at this point. The 3rd owner of this coach will not have to deal with what we did over the past 6 years. That said, we didn't break down once in 24K miles of traveling. Many of the projects have been directed at making maintenance easier, simplifying things and/or improving reliability. These things avoid aggravation while saving time and money. For example, the anti-scald valve has been put on faucet feeder hoses to make accessing it easier. This also avoids stress on the Hydro-Hot heater exchanger feeder tube which shouldn't be used to support the weight of that valve. If that tube breaks off, you'll be faced with an expensive repair bill. Having feeder hoses installed also allows flushing calcium salts from the heat exchanger. You can find details on this HERE. Owing to ease of keeping things up to date, I've used a BLOG format to document upgrades, repairs and projects. I think it's important to know all the details so an intelligent purchase can be made. I hope readers of this material find the information presented herein helpful. I've included some informative links below to BLOG pages, dedicated HTML pages and slide shows that provide details on what's gone on with this coach: Feel free to contact me if you have any questions or need additional information. Item 4 documents things that may require some attention depending on how sensitive you are to cosmetics. None of the items are serious or compromise safely and reliability. This coach, like all those using Owens Corning panels, has some check cracking in the dark areas. This is a cosmetic flaw only. A more serious problem is peeling clear coat which isn't an issue for this coach. Also the newer Cummins ISL 400 engines had wrist pin failures. The engine in this coach (circa 2004) predates this problem. Diesel engines prior to 2007 avoid the new problematic emissions equipment. Feel free to check the serial number of the engine with wrist pin failure cutoff serial numbers. The aluminum radiator in this coach has been replaced with a cooper core and steel tank radiator. Aluminum radiator failures were common in many coach makes, years and models. These stem from improper mountings and supports. Massey Diesel in Arizona put a new radiator in this coach so radiator leaks aren't a problem moving forward. This is well documented in the Fix It material. Also the PTO spline that drives the hydraulic pump has failed on some models. Not usually the Allure series. I've inspected the spline on this coach (pictures available) and packed the joint with synthetic grease annually. The connection remains in perfect condition. The sub-woofer compartment had improper bolster molding installed which led to rattles. This was fixed by adding the proper support to make the woofer chamber tight and avoid vibration. I mention the above just to highlight a few issues that accompany new model coaches. I've got tons of pictures of this coach both inside and out. Just about all the campgrounds we've stayed at have pictures available. The links to these slide shows are below and should give you a good idea of what this coach looks like and where it's been parked: If you need some additional pictures and/or close ups taken I'd be happy to do that if it helps the next owner get a better idea of some aspect of the coach. Owing to our travel requirements we purchased lots of extra equipment before leaving New Jersey to support the different modes of travel we anticipated. As experience was gained over the road we saw the need for additional improvements which led to some extra items being required. 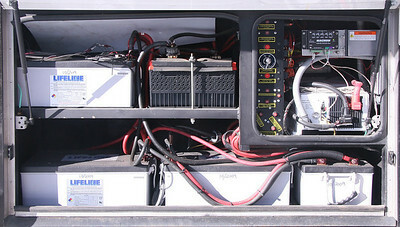 For example, remote filling of diesel and water was anticipated. We have two ATL bladder tanks for handling this situation. I made a service ramp system to allow getting under the coach for repairs, inspections and routine service items. The goal was to be as self supporting as possible. This was especially important in the more remote areas we stayed in. A list and slide show highlight the extras that go along with the coach. Dust control is very important in a small living space. From the beginning we've used high quality 1" polyester filter material with a tacking agent in both A/C intakes. This has avoided dust buildup in the ducting and hence the potential for mold to grow. We also run a stand alone dust filter 24x7. 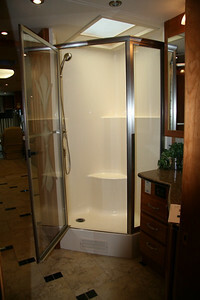 A slide show of some of the above items is HERE. Both Jeannie and I are hoping to find the next owner of our coach. Someone that will use and enjoy it as we have over the years. It's setup for full time 4 season cold weather travel but could easily be used for 2-4 month mild seasonal excursions if that fits your requirements better. We stayed in Park City for 3 winter seasons and saw temperatures down to -24F and remained comfortable. This coach has many more good years of comfortable and reliable travel ahead of it. On our website (www.muniac.com) you'll find tons of information about our travels as well as how this coach enabled us to access and enjoy some very interesting places in all seasons. Feel free to browse this to gain additional information about how this coach was used and where it's been. If you're interested in purchasing a Country Coach 2006 Allure 430 series for your traveling this one will make a good home base. Please feel free to contact Scott (contact information is above) for any information you may need. I'd be happy to speak with any qualified buyer. I can also deliver the coach for a fee to a location within reason. Professional delivery is also available and would be at the buyer's cost. Those details can be worked out ahead of time as required. Please let me know if you need any additional information or if I can help you further in deciding if this coach is the right choice.